May 22 – Mt Everest Update – Pushing to the Summit | Edita's Blog - "Intotheblu"
Edita and the Altitude Junkies left camp 3 for the summit a few hours ago. I dont think I will sleep tonight as I put myself in their shoes , ok crampons 🙂 I hope others are preparing for the celebration, especially in Lithuania. This is a great day for Lithuanian and its woman. It is 20 years ago since Vladias was the first Lithuanian man to summit Everest. 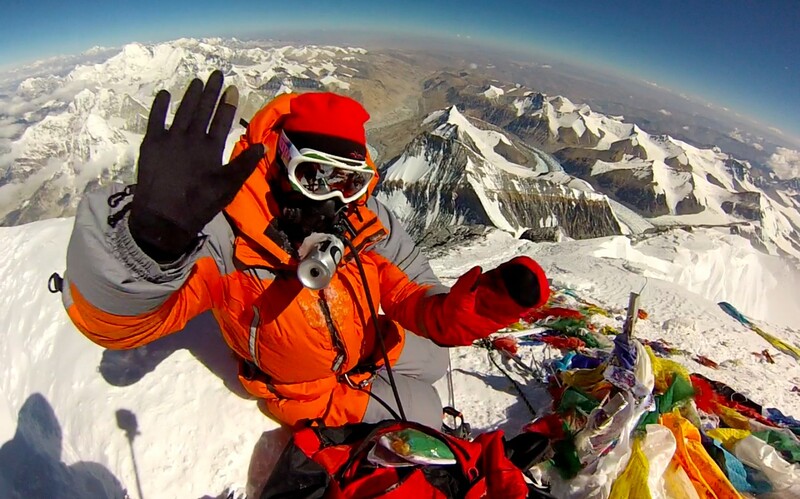 He arrived in Katmandu with 500 dollars in his pocket and got to the summit! Today, Edita, after saving every penny she could, makes her push for the summit. For those of you that do not know her, she can only be described as hard working, strong, focused, committed , truly humble and a beautiful person. This is how I would describe almost every Lithuanian I have had the pleasure of meeting, other than adding that they are very friendly. Not even looking at or thinking about what a monumental achievement this would be, she said she was going to do it and she is doing just that. Edita is the epitome of many Lithuanians. She reflects what it has taken Lithuania to get through the events before, during world war 2, and after. Climbing this huge mountain may seem like such a small thing for most people from the world of absolute freedom and equality but changing the mindset of a country is a huge thing and her showing that woman can “do it”, is a big thing. For Lithuania and its woman, her achievements are an important leap for Lituania. Go visit Lithuania and talk to the people one day. You will understand just how good you have had it and how hard others have had to fight to truly have, not just the laws needed ,but also the mindset needed to break out of “the old ways”. As a Canadian, that always took these “things” for granted, getting to know the people and the country of Lithuania has been an eyeopener. Edita’s empathy ,after she witnessed those that are really hungry through no fault of their own, has not been shared by everyone. This has been demonstrated by some of the comments on the Everest for Sahel Campaign but not shared by everyone. If we cant give a little of what we have to those that are in need, than what we have is selfishness. Thank you to all those that have helped, you know who you are, you will not be forgotten. Go Edita Go and …Go Lithuania Go!!! I hope to relay Good news to you all soon. Thank you all for “being there”. Great Edita! Be safe and stronger–I wait for your good news:). She is in our thoughts !! !